Are You Looking for Women's Knitted Aran Jumpers? You can buy fantastic Ladies knitted Aran jumpers and womens Aran cardigans for you all made from 100% British wool giving fantastic quality! Have you checked out our womens Aran knitwear range? There, you can buy the traditional cable knit design and includes a choice of colours of wool and sizes to suit you. These traditional Aran sweaters are ideal for you to wear on cold winter evenings and are sure to keep you cosy. Have You Thought About Buying a Poncho? Maybe you prefer one of our Irelands Eye ponchos? You can choose a womens poncho in the Aran pattern knit, or a Carraigdonn Patchwork Ladies Aran Cardigan with one button fastening. The choice is yours! Can I Buy a Jumper for Men and Women? 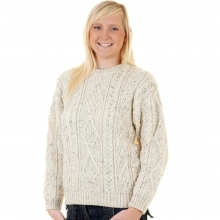 Have you looked at our range of ladies and mens Arran knitwear? You will reap the benefits and value for money with the cable designs that will last you for many years without going out of fashion making them a great buy and a great gift too! What Other Women's Clothing Can I Buy? As well as our ladies cable knit sweaters you can also look at the stock of womens clothing and accessories. Why don't you Click here and view our full collection now?